While the television industry is wondering whether Brian Williams will ever return to "NBC Nightly News," ABC's George Stephanopoulos is wondering why the anchorman's fib about Iraq got on the air in the first place. "I gotta say, I'm surprised -- I didn't quite understand how it got into the broadcast," Stephanopoulos said in a podcast conversation with the actor Alec Baldwin. Baldwin had asked Stephanopoulos, "What do you think happened there? With Brian?" and he initially sidestepped the question, saying, "I don't know." Related: Some viewers think Brian Williams deserves a second chance. Stephanopoulos, the chief anchor for ABC News, and other A-list anchors, have generally avoided talking about the Williams scandal. Last month Williams was suspended without pay for six months amid an internal investigation and external scrutiny about embellishments in past stories. Most of the alleged embellishments occurred off of NBC's air, on programs like "The Late Show with David Letterman," but at the end of January Williams exaggerated his role as an embedded reporter on an Iraq War mission in 2003 while speaking on his own "NBC Nightly News." He said he was aboard an Army helicopter when it was struck by a rocket-propelled grenade, imperiling himself and the crew members. He was actually aboard a different helicopter. Williams apologized several days later and said he had innocently misremembered the circumstances. But he came under withering scrutiny the helicopter story and for several other past reporting stories he had told. Related: What else has NBC dug up on Brian Williams? "Everybody's been watching this" in the tight-knit TV news business, Stephanopoulos told Baldwin, "and trying to figure out" what happened. Stephanopoulos said that while he's not friends with Williams, he's an acquaintance. "I've always respected his work," he said. 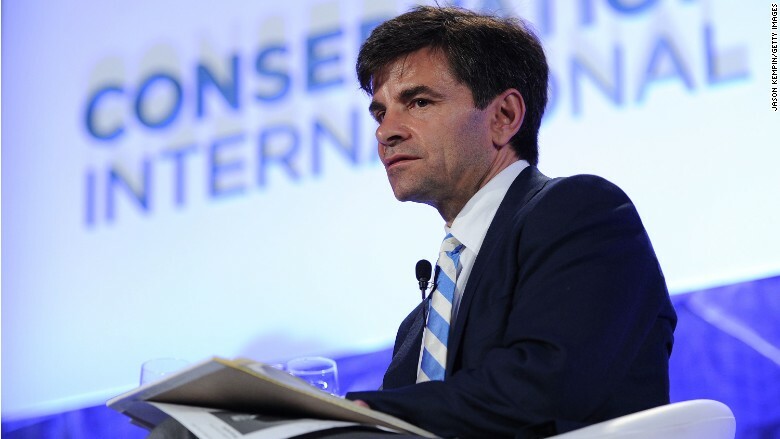 "A couple things have stunned me" about the controversy, Stephanopoulos said. "One, when you see the various clips, you're surprised at the volume a little bit, and the vividness." Then Stephanopoulos said he was also surprised that Williams' claim about Iraq made it onto the "Nightly News," because all nightly news anchors "are surrounded by big teams" that edit newscast scripts. Later, he remarked that he sometimes chafes at the "various checks and balances" in his newsroom, but knows "it's there for a reason." NBC has declined to comment on its internal processes, citing the news division's ongoing fact-checking investigation. Baldwin, who hosts "Here's The Thing" for WNYC radio, knows NBC well, since he co-starred on NBC's "30 Rock" for many years and briefly hosted a talk show on the network's cable news channel MSNBC. He brought up the idea that there was "no one to say no" to Williams, that "he was his own boss, he had no censor." Stephanopoulos responded, "Isn't that the danger in all life, though? When you don't have someone who-- whether it's your wife or your best friend or your brother or sister--"
Baldwin chimed in, "God knows I've got a wife that lets the air out of me from time to time, trust me!" Baldwin also proposed that Williams, with his Iraq story, was "wrapping himself in the flag and in the glory of the military to please his audience." Stephanopoulos didn't respond to that suggestion. But as the conversation wrapped up, the anchor said that one of the "cautionary tales" of the Williams controversy is that seemingly safe, high-profile anchor jobs can be lost in an instant. "We all make mistakes," Stephanopoulos said. "I don't think I would do what he did, in that case, but we all make mistakes -- and you realize, it can go" -- he snapped his fingers -- "like that."